Dhanbad district was constituted in 1956 by carving out the old Dhanbad subdivision, Chas and Chandankiyari police stations of the Sadar subdivision of the erstwhile Manbhum district. Dhanbad is Police district since 1928. The re-organisation of the districts in the State of Bihar which took place after 1971 did not affect the district of Dhanbad. In 1991 a part of Dhanbad district was sliced away to form Bokaro district. The district is bounded on the west by Giridih and Bokaro on the north by Giridih and Dumka and on the east and south by Purulia district of West Bengal. The total geographical area of the district is 2886 Sq. Km. The distrcit has one sub-division called the Dhanbad Sadar and 8 blocks viz. Jharia , Baghmara, Dhanbad, Nirsa, Govindpur, Baliapur, Tundi, and Topchanchi. The blocks in turn have 181 panchayats and 1348 villages. The important places to visit in the district are Charak Pathar, Chati Gobindpur, Gopalpur, Jhinjhipahari, Meva, Panrra, Chark – Khurd, Topchanchi, Maithon, Panchet and Jamadoba. Entranceindia.com provides sample papers for ICAR AIEEA UG 2019 aspirants. We have provided sample papers for both the Streams i.e. Stream A and Stream B. Sample paper for Stream A covers questions from Physics, Chemistry and Biology where as Stream B Sample paper covers questions from Physics, Chemistry and Mathematics. From these sample paper one can know the questions pattern of the ICAR AIEEA UG 2019 Exam. These sample papers contain questions according to latest ICAR AIEEA UG Exam pattern. AIEEA UG 2019 Sample papers will help aspirants to understand the concepts of the actual exam. The sample questions are prepared according to previous year exam question pattern. We urge students to practice sample questions and then they can try our model papers. Sample papers for ICAR AIEEA UG 2019 are given in online mode. Students can practice those sample questions after creating their user id. Stream A ICAR AIEEA UG 2019 Sample Paper contains 15 questions from physics, 15 questions from Chemistry and 15 questions from Biology, where as Stream B ICAR AIEEA UG 2019 Sample Paper contains 15 questions from physics, 15 questions from Chemistry and 15 questions from Mathematics. For thorough preparation, Entranceindia has released preparatory course for AIEEA UG Stream B entrance exam aspirants. The preparatory course has 270 chapter tests from Physics, Chemistry and Mathematics. Each chapter will have 50 questions with step by step solution. 10 full syllabus model papers are included in this package. Each model set contains 180 questions. There is option to attempt Physics, Chemistry and Mathematics tests separately. Questions are prepared by our experts according to ICAR AIEEA UG Stream B syllabus. For thorough preparation, Entranceindia has released preparatory course for ICAR AIEEA UG Stream B entrance exam aspirants. This course contains more than 6000 questions with step by step solution. The preparatory course has 270 chapter tests from Physics, Chemistry and Mathematics. Each chapter will have 50 questions with step by step solution. 10 full syllabus model papers are included in this package. Each model set contains 180 questions. There is option to attempt Physics, Chemistry and Mathematics tests separately. Questions are prepared by our experts according to ICAR AIEEA UG Stream B syllabus. Students are advised to include this course in their curriculum to secure good position in the entrance exam. For thorough preparation, Entranceindia has released preparatory course for AIEEA UG Stream A aspirants. The preparatory course has 270 chapter tests from Physics, Chemistry and Biology. Each chapter will have 50 questions with step by step solution. There are 10 full syllabus model papers included in this package and each model set contains 180 questions. There is option to attempt Physics, Chemistry and Biology tests separately. Questions are prepared by our experts according to ICAR AIEEA UG syllabus. Indian Council of Agricultural Research (ICAR) conducts National Level Entrance Examination every year across India. This exam is known as All India Entrance Examination Agriculture (AIEEA). For both Stream A and Stream B Entranceindia.com has released preparatory course. Both papers are available in online mode, DVD mode and Pen Drive mode. AIEEA UG Stream A preparatory course covers chapter-wise questions from Physics, Chemistry and Biology. The chapters are taken from 10+2 syllabus. Each chapter has been divided into three sections named as Level I, Level II and Revision test. After completing one chapter, students can take chapter test for self assessment. You will get answer and detail explanation to each question in the chapter test. Apart from the chapter tests, there are 10 full syllabus mock tests are included in this package. Entranceindia.com has released Model Papers for AIEEA UG Stream A. From sample papers you can get the glance of our Model Papers. These model papers are designed by our experts and cover every chapter from the ICAR AIEEA UG syllabus. These AIEEA UG model papers will give exam like environment and students will be benefited by practicing these model papers. When it comes to evaluation of performance, from these model papers students can assess themselves better in terms of preparation. AIEEA UG model papers can serve as a great reference for the preparation of the entrance exam. AIEEA UG model papers for Stream A contains 60 questions from Physics, 60 questions from Chemistry and 60 questions from from Biology. Stream B preparatory course for AIEEA UG has been released by Entranceindia.com. This preparatory course covers chapter-wise tests from Physics, Chemistry and Mathematics. All the chapters have 50 questions and divided into three sections. Step by step solution to each question has been provided. By practicing these chapter-wise tests one can expect better performance in the coming AIEEA UG Exam. 10 full syllabus model papers are included in this package. Entranceindia.com has also released Model Papers for AIEEA UG Stream B. Stream B AIEEA UG model papers cover each and every chapter from ICAR AIEEA UG Syllabus. Physics and Chemistry is common for both the streams, where as Mathematics questions have been added in Stream B model papers. AIEEA UG Stream B model papers will supplement to your entrance exam preparation. The ICAR AIEEA UG model papers will help students with time management which is a crucial aspect for the aspirants who are appearing AIEEA UG. There are 60 questions from Physics, 60 questions from Chemistry and 60 questions from Mathematics in Stream B AIEEA UG model papers. Entranceindia has released model papers for ICAR AIEEA UG 2015 Stream A Exam. There are 10 full syllabus model papers and contains 180 questions in each set. Each model paper set has three sections i.e, Physics, Chemistry and Biology. Each part has 60 questions and each correct answer carries 4 marks. Questions are prepared by our experts according to ICAR AIEEA UG 2015 syllabus. These questions can be very helpful for ICAR AIEEA UG 2015 aspirants because of the extensive coverage of the chapters from the ICAR AIEEA UG syllabus. Practicing these questions will boost confidence of the students appearing ICAR AIEEA UG 2015 Exam. Tests prepared by expert teachers. 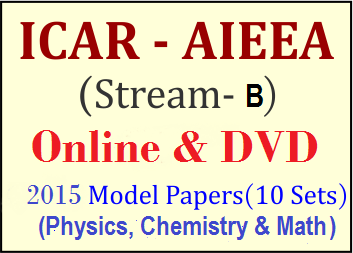 Anyone going to appear ICAR AIEEA UG (Stream A) 2015 can take these online model papers for best result. Entranceindia has released model papers for ICAR AIEEA UG 2015 Stream A Exam. There are 10 full syllabus model papers and contains 180 questions in each set. Each model paper set has three sections i.e, Physics, Chemistry and Biology. Each part has 60 questions and each correct answer carries 4 marks. Questions are prepared by our experts according to ICAR AIEEA UG 2015 syllabus. These questions can be very helpful for ICAR AIEEA UG 2015 aspirants because of the extensive coverage of the chapters ICAR AIEEA UG syllabus. Practicing these questions will boost confidence of the students appearing ICAR AIEEA UG 2015 Exam. Anyone going to appear ICAR AIEEA UG (Stream A) 2016 can take these online model papers for best result. Entranceindia has released Model Papers for ICAR AIEEA UG (Stream A) Entrance Exam. There are 10 Full Syllabus Model Papers and each set contains 180 questions. Each Model Paper Set has three sections i.e, Physics, Chemistry and Biology. Each Subject has 60 questions and each correct answer carries 4 marks. Questions are prepared by our experts according to ICAR AIEEA UG syllabus. Practicing these questions can be very helpful for ICAR AIEEA UG (Stream A) aspirants because of the extensive coverage of the chapters from ICAR AIEEA UG syllabus. Practicing these questions will boost confidence of the students appearing ICAR Stream A Entrance Exam. ICAR AIEEA-UG- 2015 Syllabus for Stream B contains subjects such as Physics, Chemistry, Mathematics of 10+2 standard of CBSE Board. ICAR-AIEEA Exam Pattern shall have a total of 180 questions with a maximum of 720 marks for the paper. Each subject will have 60 multiple choice questions of 4 marks each. Each correct answer carries 4 marks and there will be no negative marking for any wrong answer. Students can appear Physics, Chemistry, Mathematics Tests separately with timer for each test. View test report after submission of the test. Unlimited Test Reviews till completion of your exam (AIEEA 2015) with detailed solution. Easy to follow solutions can be viewed for both correct as well as incorrect responses.